Sts. 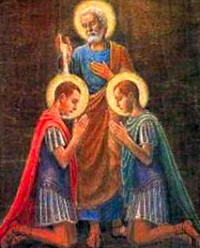 Nereus and Achilleus were servants of St. Flavia Domitilla. She was the wife of the consul Flavius Clemens. cousin of the Emperor Domitian. She died in exile on the island of Pandataria. Her granddaughter, likewise Domitilla, also died in exile on the island of Pontia. The virgin whose feast is celebrated to-day is the second Domitilla. The fourteen-year-old Pancras suffered martyrdom probably in the reign of Diocletian, and was buried by the matron Ottavilla on a property belonging to her on the Via Aurelia, where the basilica dedicated to him still stands. There the station is celebrated on Low Sunday, when the neophytes, newly born in the Spirit, used to put off their white baptismal garments. In the Middle Ages it was the custom that the most solemn oaths should be taken at the tomb of the martyr Pancras, as though the simple innocence of a childhood consecrated by the blood of martyrdom would ensure a safer guarantee of their genuineness. The Romans venerated him with great fervour. Let the blessed solemnity of Thy martyrs, Nereus, Achilleus, Domitilla, and Pancras, ever comfort us, we beseech Thee, O Lord, and render us worthy of Thy service. Through our Lord Jesus Christ, Thy Son, Who liveth and reigneth with Thee in the unity of the Holy Ghost, God, Forever and ever. R.Amen. Lesson from the Book of Wisdom. The just shall stand with great constancy against those that have afflicted them, and taken away their labors. These seeing it, shall be troubled with terrible fear, and shall be amazed at the suddenness of their unexpected salvation saying, within themselves, repenting and groaning for anguish of spirit, These are they whom we had some time in derision, and for a parable of reproach. We fools esteemed their life madness, and their end without honor. Behold, how they are numbered among the children of God, and their lot is among the saints. Alleluia, alleluia. V. This is a true brotherhood, which hath overcome the sins of the world: it hath followed Christ, laying hold upon the heavenly kingdom. Alleluia. V. The white-robed army of martyrs praiseth Thee, O Lord. Alleluia. At that time, there was a certain ruler Whose son was sick at Capharnaum. He having heard that Jesus was come from Judæa into Galilee, went to Him, and prayed Him to come down, and heal his son; for he was at the point of death. Jesus therefore said to him: “Unless you see signs and wonders, you believe not:” The ruler saith to Him: Lord, come down before my son die. Jesus saith to him: “Go thy way, thy son liveth.” The man believed the word which Jesus said to him, and went his way. And as he was going down, his servants met him; and they brought word, saying that his son lived. He asked therefore of them the hour wherein he grew better. And they said to him: Yesterday at the seventh hour, the fever left him: The father therefore knew that it was at the same hour that Jesus said to him: Thy son liveth; and himself believed, and his whole house. Let the confession of Thy holy martyrs, Nereus, Achilleus, Domitilla, and Pancras, be pleasing unto Thee, we beseech, O Lord, both to commend our offerings and ever to implore Thy pardon for us. Through our Lord Jesus Christ Thy Son our Lord, Who liveth and reigneth with Thee in the unity of the Holy Ghost, one God Forever and ever. R.Amen. Rejoice, ye just in the Lord, alleluia: praise becometh the upright, alleluia. We beseech Thee, O Lord, that by the supplications of Thy blessed martyrs, Nereus, Achilleus, Domitilla, and Pancras, the holy sacraments which we have received may profit us for the increase of Thy favor. Through the Lord Jesus Christ, Thy Son, Who liveth and reigneth with Thee in the unity of the Holy Ghost, one God For ever and ever. R.Amen.